Ever since photography was invented (I mean 24x36 frames, rolls of film and light cameras), "humanist" photographers have travelled the world over to collect snapshots and report to people about other people's lives. I came across Edouard Boubat's pictures in the mid-sixties, and especially remember the portrait of a young Swedish girl, sleeping. In one detail (the imprint left by a crumpled sheet on her naked breast), Edouard had managed to capture the intimacy of this end of a night. Indeed the art of this great master wasn't all graphic simplicity and sobre compositions: he could also be a sincere witness. The sincerity of his encounters was a guarantee of the sincerity of his testimony. 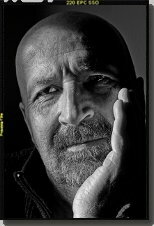 And for nearly 40 years, solely inspired by this other world and the discovery of new horizons and of those living there, I have been driven by the same passion and relentlessly followed the path of the "rencontreur-photographe", a photographer open to encounters. In this photo gallery you will be able to acquire, through secure payment, original prints, interpreted by Jean-Yves Bregand, the indisputable master of traditional photo printing on baryta paper. Single format (pictures in 24x36cm on paper in 30x40cm). Edition limited to 5 signed numbered plates. Single price : 1000,00 € (taxes and transport costs included).